I think it’s kind of a funny story that I was one of the last ones to hop onto the bandwagon for this book. Although I had heard good things about it when I first found out about it, I felt that I wasn’t ready for the deep issues that this book tackles. Now that I have gotten a bit older, I decided to give this story a read. 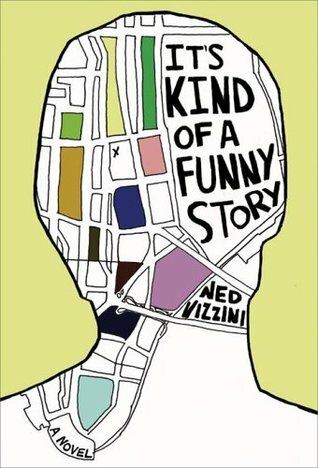 I thought that It’s Kind of a Funny Story was an excellent novel in terms of diversity and storyline. I loved the quirky characters and although teens considering reading this book should be mature enough to handle talk of suicide and other sensitive topics, that will not stop me from recommending it. To briefly synopsize, this book follows the point-of-view of a teen named Craig who resides in New York City. Because of his outstanding grades, he finds himself in a prestigious high school for gifted students. Unfortunately, the academic pressure is too much for Craig, and it gets so bad to the point where he almost commits suicide. He then checks into a mental hospital in which he finds many new allies with whom he can relate. Will the comfort of his new hospital mates be enough to cure his ongoing anxiety? As I (sort of) stated before, protagonist Craig was quirky with quite a unique personality. It is debatable whether he is quirky and unique in a positive or negative way, but in spite of everything, he was a very intellectually smart character. He just made some decisions that I wasn’t the most fond of, is all. With regards to the plot, be prepared because it is S-L-O-W. Not only is it super slow, but the book has over 400 pages so it may take some readers a while to finish it. Yes, the plot definitely did drag on with random filler scenes, but overall, it was amazing to see how Craig developed from start to end and how he got to know all of the eccentric people from his hospital ward. To sum it all up, It’s Kind of a Funny Story was a very interesting and diverse perspective on mental health, but due to its deep suicidal themes, I would say that readers should still be very mature and emotionally strong to read this book. I loved that it encouraged people to get help if and when they need it- many tend to overlook this. So, if you are one of the few YA readers who hasn’t picked up this book yet, I’d command you to do so! This is one of those books that I’ve been meaning to read since forever and yet never get to. Maybe in the new year I’ll finally get to it. Great review! great review!!! i totally agree. I’m glad you liked it, I LOVE Its Kind of a Funny Story! If you don’t know, there is a movie adaption (it came out in like, the mid-2000s) and its actually a pretty good adaptation (not perfect, its a little different story-wise, but I liked it). Another book by Ned Vizzini – Be More Chill – has a broadway musical too, and its the funniest thing, if you’re into that. I recommend it!